Now, almost 50 years later, despite the passing of most original members, the group survives as one of Baltimore's oldest independent social clubs. Composed today almost entirely of tavern owners, and beer and liquor salesmen, the organization was born from an idea originating in a bar in the Waverly section of Baltimore City, according to Richard K. Coggins, one of the oldest members. "Gus Rauh had his tavern at 29th and Greenmount. On that hot day in August, Gus took a small group of his customers down to his home on Rockaway Beach in Middle River. He prepared crab cakes, crab soup, jumbo hard crabs, corn on the cob, sliced tomatoes, and cold beer. When the group arrived at Rockaway Beach, they proceeded to enjoy the food and beer in a nice breeze on his front lawn. Gus had a beautiful home on the beach right across from the Baltimore Yacht Club," Coggins relates in a short history of the group. The group of guests was so pleased with the excellent food, cold beer, and lovely scenery that they could not express their appreciation enough. However, one of the guests, Million B. Crandall, was a top public relations man who had handled promotional work for many of Hollywood's film stars and studios. With his promotional experience and trigger mind, he quickly organized the group into an organization. He called it "The Hardshells," named after the big jumbo crab Gus had served. He started out by having the president called "The Imperial Jumbo" and Gus Rauh was elected to that office. The group elected someone to the office of "Back Fin" and someone else to the office of "Claw". They then formed a line, took a live crab, and paraded down Gus' pier and threw the crab overboard, announcing that they hoped it would produce bigger and better crabs for a future party. "Gus was so enthused over the crab party and Milt Crandall's loose-knit organization called "The Hardshells" that he planned all winter to have another gathering in 1936. On that occasion, he invited about 20 customers and friends to the feast. The second party was equal to or better than the first and Gus was again elected "Imperial Jumbo," adds Coggins to the tale, which he documented a few years ago at the request of newer members who were unfamiliar with the club's illustrious beginnings. Older residents of the beach community still remember the colorful processions as each summer's festivities seemed to surpass the preceding one. Marian McKew, daughter of deceased Imperial Jumbo Hon Nickel, owner of Baltimore's Gayety Theatre, reminisced about the Hardshell Crab Feasts of years past. "My father would get all dressed up, usually in white, and come out to get my approval before leaving for the party. By the time the men paraded out on Gus' pier decked out in Uncle Sam hats and red, white, and blue crepe paper, they were all feeling pretty good. Quite a few of them would wind up in the river along with the crabs and I can still remember dad coming home in his white suit damp and streaked with red and blue dye." In the early years of the group, some members were from walks of life other than tavern-related ones. A few were Gus Rauh's Rockaway Beach neighbors, such as Fred Kraus, a Lexington Market butcher, now deceased. Many worked in government jobs. Richard Coggins, 72, now the historian of the group, is a commissioner on the board of the State Accident Fund. Edward Starkloff, a past secretary, is a retired employee of the state and president of Md. Classified Employees' Retirement Chapter. Continuing the story of the formalization of the Hardshell organization, Coggins explained, "In 1937, Frank Breiting, one of the first Hardshells, produced the Cup that is still given to each new Imperial Jumbo to place in his tavern for the year he serves. It was decided that only tavern or restaurant owners be named to the office of Imperial Jumbo. That would keep it out of politics or from someone trying to use the club for personal gain." 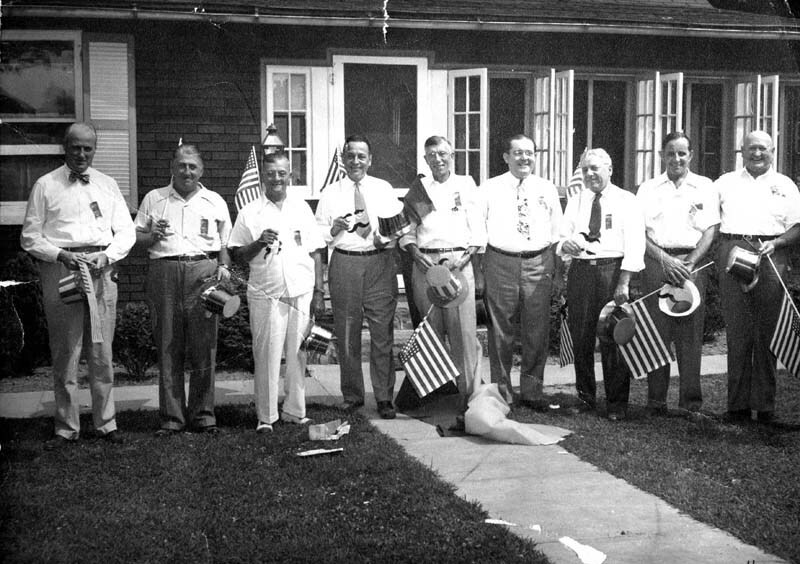 But the Hardshells counted many politicians among their friends and were joined in their festivities by such notables as Congressman George Fallon. After Gus Rauh's death some years ago, the group held their crab feasts at Baltimore Yacht Club for a time before moving the affair out of the Essex area. This year's event was held at Jerry D's Saloon on Harford Road. Although monthly meetings are not part of the club's agenda, two other social affairs besides the crab feast are held each year, Ladies Night in November (which sees the installation of the new officers) and an oyster roast in March along with the Summer feast are paid for by the annual membership fee of $50. "Strangely enough, not many members In recent years have been from Essex." quoted Bart Byrnes. The new secretary the organization, Byrnes has been Hardshell for almost 25 years. He is employee of Carling National Brewery. Gordon L. Dorer, president of the group, lives in Rossville but operates his tavern Angle Inn, on O'Donnell Street. Incoming president, James Dimitri, who will be installed next month, owns an establishment on Falls Road. The only local innkeeper who has been a member in recent years is Will Faber, owner of Yacht Club Inn on Holly Neck Road. The August crab feast was held at his place for three years before moving to a city tavern last summer. “Membership was agreed at origin to be limited to 99" Coggins recalled. "It was really plus one counting Milt Crandall," he added. It is now around 90 and new people are brought in through invitation of present members only.